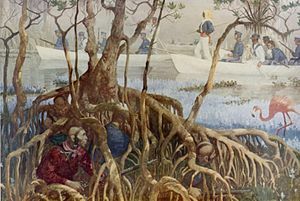 The Seminole Wars, also known as the Florida Wars, were three conflicts in Florida between the Seminole—the collective name given to the amalgamation of various groups of Native Americans and African Americans who settled in Florida in the early 18th century—and the United States Army. The First Seminole War was from 1816 to 1819 (although sources differ), the Second Seminole War from 1835 to 1842 and the Third Seminole War from 1855 to 1858. They were the largest conflicts in the United States between the War of 1812 and the American Civil War. Taken together, the Seminole Wars were the longest and most expensive (both in human and monetary terms) Indian Wars in United States history and one of the most expensive of all wars ever fought by the U.S. as a percentage of gross national product. Read More: http://bit.ly/1RfDyNf to see that Seminoles never signed a treaty with the USA.